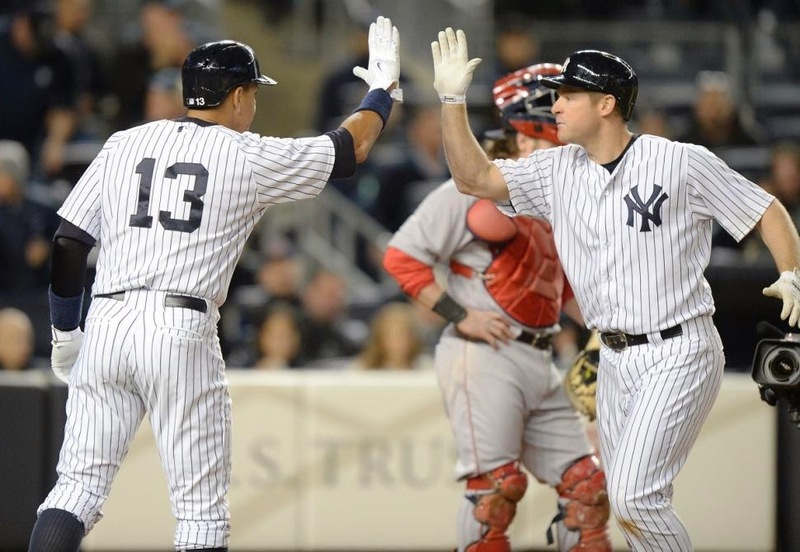 The Yankees began the highly anticipated three game set with their rivals up on Yawkee Way on Friday April 11. The greatest rivalry in baseball had returned and baseball fans drew their attention to the weekend series. The first game of the series was an absolute thriller. After the Sox jumped out to a 1-0 lead in the first, right handed flame-thrower Nathan Eovaldi settled down to turn in 5.1 IP allowed 3 ER. Eovaldi did exactly what I ask of Yankees starting pitchers: to keep the team in the game. The Yankees crawled back into the game grabbing two runs off Red Sox starter Wade Miley (who also went 5.1 IP) to trail just 3-2 after the 6th. In the bottom of the 9th, just one out away from going home on the losing end, third baseman Chase Headley smashed a solo shot off Red Sox closer Edward Mujica to tie the game at 3. With the game on the line, Headley got the clutch hit Yankees fans needed. Left-hander Chasen Shreve threw a career long 3.1 innings in extra innings and did not allow a run, keeping the score at 3-3. Neither team was able to score until David Ortiz cranked a homer off Esmil Rogers on an 0-2 count. Although infuriated with the pitch location, we encouraged Yankee fans to not give up and that encouragement was justified in the bottom of the inning. Another clutch home run, this time from Mark Teixeira tied the game up once again at 4-4. 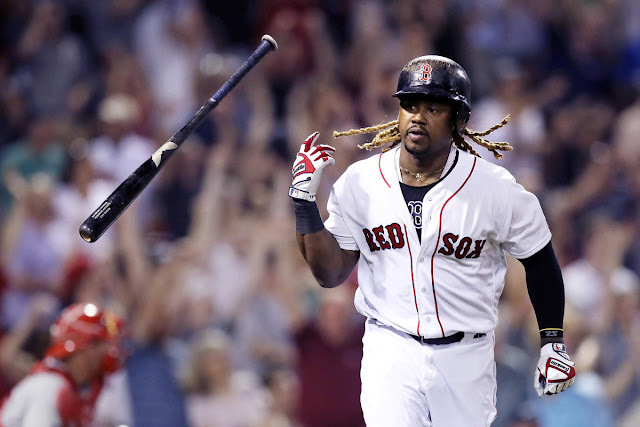 The Sox were able to scratch another run off a fatiguing Rogers in the 18th, only to allow Carlos Beltran to hit a double on a misplayed ball by Hanley Ramirez (although it would have been a sacrifice fly had he caught it with a runner on third). Despite the Yankee resilience, their efforts were not enough as the Red Sox came out victorious by a score of 6-5 19 innings and seven hours later being the longest game in the history of the rivalry. After using all members of the bench and the bullpen, Shreve was outrighted to AAA in favor of Matt Tracy to provide a fresh arm out of the bullpen. Shreve will likely be back in pinstripes by the end of the week. Game 2 of the series featured Adam Warren in his first career start against Joe Kelly. Unfortunately, the Yankees bats did not wake up as the team made Kelly (who has good stuff) look like Clayton Kershaw on the mound. Alex Rodriguez managed the only hit off Kelly who went 7 innings strong giving up just one run. 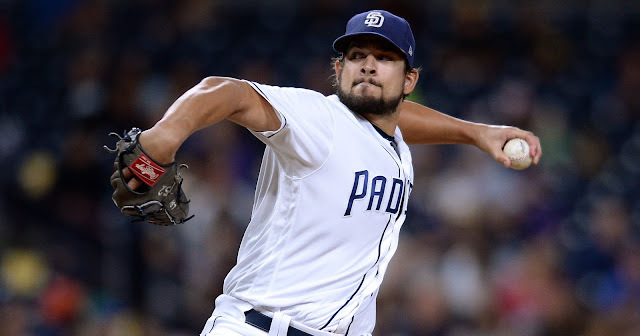 Warren kept the team in the game allowing just two runs (one earned) across 5.1 innings. Likely fatigued from the long game the night before, Justin Wilson and Chris Martin then gave up a total of 3 runs. Matt Tracy then made his major-league debut but could not manage to get any help defensively allowing 3 runs, all unearned. With the score at 8-1, Chris Young hit a 3-run homer which was just about the only offense the Yankees managed in this game. The Yankees dropped game 2 of the series 8-4. Attempting to avoid the sweep, the Yankees came into primetime, Sunday Night Baseball on ESPN, in an ace-off between Masahiro Tanaka and Clay Buchholz. After walking Jacoby Ellsbury to lead off the bottom of the 1st inning, the Yankees offense was only getting started. On a successful hit and run, Brett Gardner singled allowing Ellsbury to get to third base. With one run already in and the bases loaded, A-Rod smoked a ball in the left field gap for a bases clearing double to put the score at 4-0 Yankees with just one out. Chase Headley then hit his second homer of the season (both against Boston), a two-run shot to put the Yankees up 6-0. The very next batter was Stephen Drew, who went back to back hitting a solo shot of his own. The Yankees were able to hang a crooked number, 7, jumping out to a huge lead right off the bat. Masahiro cruised through the first three innings before getting into trouble in the 4th and 5th. Although he didn’t get much help defensively as the defensive struggles continued, but Tanaka looked better going 5 innings giving up 4 hits, 4 runs (3 ER), and striking out 4. McCann ended up hitting a home run of his own as every Yankee to come to the plate got a base hit except Garrett Jones. The Yankees avoided the sweep as the bats erupted for 14 runs on 16 hits in a 14-4 win. Game one was one of the greatest baseball games I’ve ever watched. Although disappointing that the Yankees were unable to come out on top, it was exciting to say the least. Nathan Eovaldi kept the team in the game but he was less than stellar only striking out one batter across 5.1 innings. The Yankees continually came up in the clutch, with Headley’s homer, to Teixeira’s homer, to Beltran’s RBI double to tie it in the 18th. Ultimately, the Yankees ran out of pitching and that’s what cost them the game. Gutsy performances from Shreve and Rogers kept the Yankees in the game throughout. Fatigue caught up to Rogers in the late innings of his outing but he still did incredibly well for a guy pitching on back to back days. It was very disappointing that I stayed up watching all of it (until after 2 a.m. ET), but looking back on it, it was absolutely worth it. While game one was the best game of the series, the quick turn-around to a 1:05 p.m. ET game the same day game one ended was not a good game for the Yankees. The team’s offense never came through as Rodriguez managed to get the only hit off Kelly in the 7 innings he pitched. Adam Warren pitched a good game but did not get enough swings and misses; however, I do expect that to improve over time. A used up bullpen struggled to keep the game tight in the later innings. Chris Young was able to hit his first home run of the season, a 3-run shot which was the lone bright spot of the game. In game three, the Yankees enjoyed an offensive explosion. This was the game us Yankee fans had been waiting for as the team hung a 7-run first inning off Clay Buchholz. The first inning included a bases clearing double from Alex Rodriguez, then a home run from Chase Headley, with Stephen Drew hitting his first of the season right after Headley. The bases clearing double from A-Rod on primetime Sunday Night Baseball was a great moment and a momentum shift the Yankees needed in the series. Masahiro Tanaka certainly looked better than he did on Opening Day and is getting closer to being his old self, so I’d give him another start or two before he reaches that point. As I tweeted, if the Yankees could have half that much offense every game I’d be satisfied. This game was a classic case of the ole cliché “everybody hits, everybody scores!” I’m just hoping the Yankees can continue the power surge they had in this game into future games. The Yankees will begin a three game series with the division foe, the Baltimore Orioles. With the series in Baltimore, the Yankees look to gain more ground early in the season in the AL East. It appears that Michael Pineda will throw in game one with CC Sabathia following suit and Eovaldi starting the series finale which will be on Wednesday, April 15. It is imperative that the Yankees keep pace in the wide-open AL East by winning key games in April. Games in April are just as important as others and it is important us Yankee fans take this to heart, but remain positive and behind our guys! 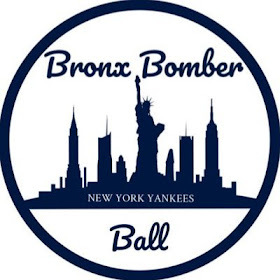 Follow the @BronxBomberBlog on twitter for Yankees news, updates, in-game tweets, satire, analysis, etc. !